‘Hello, my name is Bethany and I am a travel junkie.’ I became hooked on travel at the young age of 11, when my parents took my sister and me to Tahiti for vacation…you know the first hit is always free. I was fascinated by being in a foreign place, speaking a foreign language and was entranced by the first stamp in my brand new passport. My addiction intensified as I got older and travelled to more places. 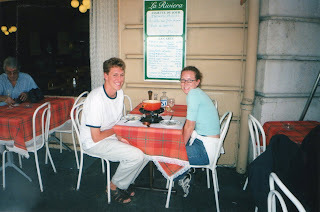 I backpacked Europe the summer of 2001 and managed to create a lifelong travel habit. I visited 16 countries in three months, made countless discoveries about myself and realized that my place in this world is on the road, always looking for that next travel high. My travel addiction is not nearly as seedy as it may sound. Much like any other addiction, travel costs a lot of money and pretty much controls your life. However, rather than being self-destructive it is productive and positive. I have so many memories, photos and stories to share. I have learned, experienced, tasted, and felt so many wonderful things abroad. I never want to be cured of my travel dependency. Rather than a cure for us travel junkies, which would be as tragic as not ever being afflicted in the first place, I propose a program to feed the ‘beast’ (the beast being the insatiable curiosity that prompts us to discover this beautiful world we live in). My program grounds itself in the antithesis of any other addiction cure…we shouldn’t rid ourselves of travel fixation. Rather, intensify it by sharing memories while giving others ideas of where to go next. We’re all in this together! 1) The West Highland Line to Fort William, Scotland. 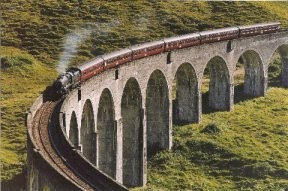 One of the most scenic railway lines in Britain and made famous in the Harry Potter films for being the train to Hogwarts. We met a drunken Scottish man named Dean who kept repeating to us ‘go geet a cop fursum vodka.’ ‘Pardon?’ I said. He slowly enunciated in his drunken Scottish accent,’ GO GET A CUP FOR SOME VODKA!’ We fetched a couple of plastic cups from the refreshment trolley and he shared his illicit libations with us while chatting about random subjects in indecipherable Scottish through the most beautiful countryside in the world. Sponsor Note: In Fort William check out Ben Nevis, Britain’s highest peak! 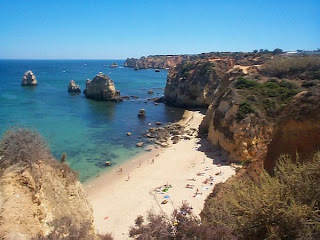 Sponsor Note: Check out Lagos’ many gorgeous and isolated beaches. 3) Our 48 hour S-L-O-W train ride from Lagos, Portugal to Paris, France where we had hoped to catch a train to the French Riviera. Once we arrived in Paris we found out that the last leg of the trip (to Marseille) had not been booked properly and there weren’t any seats available. We had the choice to stay in Paris and wait for another train to Marseille whenever one was available (we would return to Paris for a week at the end of our journey and wanted to see as much of Europe before then as possible) or choose somewhere else to go to. We meandered up to the departure board and randomly chose the next train. We were off to Lausanne, Switzerland! Sponsor Note: The Eurail Pass allows you the spontaneity to go wherever you want on a moments notice. Lausanne is a picturesque town situated on the shores on Lake Geneva. Indulge in some fantastic fondue while enjoying views of the lake. 4) Fresh mussels at La Lanterna in Cinque Terre, a string of five small villages on the Italian Riviera that hug the rugged Mediterranean coastline. La Lanterna is a small family run restaurant that over looks the beautiful Riomaggiore Harbour. The owner is a local authority on quality seafood. Make sure to get a table on the terrace. Excellent meal! 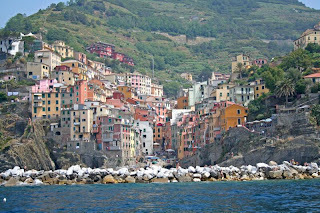 Sponsor Note: There are no roads in Cinque Terre so if you’d like to explore more than one village, you can walk between them or take the one rail line available. Embrace the seclusion of these peaceful and charming villages and forget about the hustle and bustle for a while. 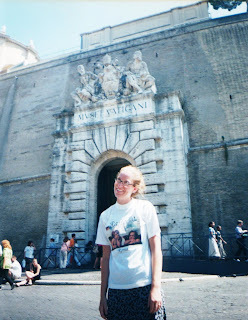 5) Buying a cheesy tourist tee shirt to cover my bare arms so that I could enter Vatican City. I was wearing a sundress and little did I know bare arms are not permitted. Rather than trek all the way back to the hotel to change, I purchased a very cheesy and very cheap tee shirt at the kiosk across the street. I was truly a vision in my Raffaello tee shirt! Sponsor Note: Remember, when visiting most any cathedral in Europe bare arms and legs are not allowed. 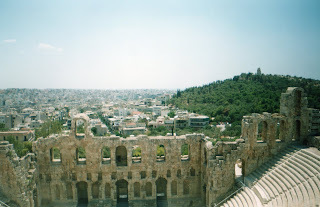 6) Strolling the city and markets of Athens. What a mess Athens is! It’s hot, dirty, and chaotic, but I had a great time there! Walk a bit, take in the history, stop at a café for a beer, walk a bit more through the labyrinth of the markets, stop for an ice cream, dodge a mob of stray cats, walk a bit more and barter for junk you don’t need, stop for a lemonade, rinse and repeat. We laughed and talked all over the sweltering, grimy metropolis. Sponsor Note: On one of your many rest stops try a Frappé, a foam covered iced coffee drink, very popular in all of Greece. 7) Enjoying outrageous goulash, a Hungarian beef stew made with paprika, and red wine in Budapest. 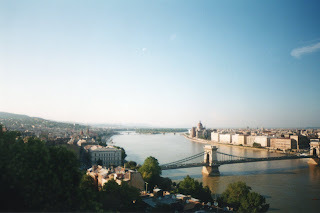 The city is divided into two parts by the Danube River, Buda and Pest. We enjoyed a very romantic meal on the West bank (Buda) while taking in stunning views of the night time lights of Pest. Sponsor Note: Hungarian paprika is world renowned so if you don’t have the goulash make sure you try something with this heavenly red powder. 8) Imbibing in some beer while enjoying HUGE pretzels at Hofbrauhaus, one of Munich’s oldest breweries. A lively and historic beer hall, Hofbrauhaus is a must see in my book. Sponsor Note: Get a picture of the massive beer stein next to your head and you too can look like a hobbit. 9) Forgetting to exchange British pounds to Irish pounds (pre-Euro time) before we arrived at the port in Dublin, Ireland. There wasn’t an ATM or 'cash point' as they say. We didn’t really have a choice (so we thought) so we asked how long it would take to walk into city centre. The lady at the information desk started laughing and said she had never heard of anyone walking from the port into Dublin. We told her we didn’t have the correct currency for a taxi (and we were low on money anyway), she said it would take, ‘quite a while’. We decided to go for it and we proceeded to walk through a toxic, hazardous wasteland. We trekked through chemical refineries and past signs with skulls and crossbones warning people not to enter. Um yeah, I tried to hold my breath until I thought I might pass out. Then I embraced the smoggy offshoot of this industrial periphery as we laughed our way into town. We finally arrived in the city after hours of walking and celebrated with a cold pint of Guinness, which we paid for with our newly acquired Irish pounds. Sponsor Note: Take a taxi and have the driver stop at an ATM once you reach Dublin; this is what sane people would do. I don't have any photos here...definitely not a photo op in sight! 10) Taking in the view (and sunset) from Senor Zorba’s in Santorini, Greece. This was the most stunning sunset I have ever had the privilege of witnessing. 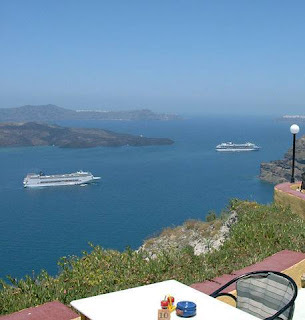 The restaurant is perched atop the cliffs of the caldera overlooking the volcano and the Aegean Sea. Sponsor Note: Stick with the margaritas…no offense, the Greeks don’t make the best Mexican food, big surprise. Now that we’ve had some group therapy, type sidestep.com or skyscanner.com (my favourite travel fare sites) into the browser bar on your computer, pick the next place you want to go, click purchase ticket and off you go. Don’t worry… I won’t tell anybody. Tickets for our next trip - Mexico- booked! Don't tell anyone.